The BEN project is a collaboration across a number of expert groups. The BEN project at LSBU is led by Principal Investigator Professor Andy Ford. Prof. Ford is an expert in heat networks technologies and is a former president of CIBSE, and is currently Director of the CEREB research centre at LSBU. Previously, as founder of Fulcrum Consulting and Technical Director at Mott MacDonald, he has worked on district heating schemes from the 1970s social housing schemes through to mixed use thermal storage proposals, such as the carbon reduction master plan proposal for Kensington 1851 Commission covering the Museums and Imperial College. The BEN research work packages are led by Dr Aaron Gillich. Aaron currently works at CEREB/LSBU as a Senior Lecturer in Energy and Building Systems Engineering. He is an engineer by trade, and his expertise is in energy efficiency policy, specifically modelling and evaluating decision making in complex systems. His current research interests include the UK energy trilemma and strategies to deliver carbon free heat by 2050. ICAX is project lead and coordinator on the BEN project, and is responsible for the design of the core plant elements including the high temperature heat pump and Cold Water Heat Network, in addition to the interface packages that knit the various elements of the system together. ICAX is a cleantech company helping to meet the demand for on-site renewable energy and sustainable development by using interseasonal heat stores to achieve low carbon buildings. ICAX provides a turnkey package for meeting sustainable energy targets on construction projects. They undertake design and installation to ensure that heating and cooling needs are met in a sustainable way by recycling energy. ICAX provides a complete range of services from initial feasibility, through thermal modelling, design and delivery, to in-use maintenance. The ICAX Cold Water Heat Network (CWHN) will connect two buildings on the LSBU site, and provide heating and cooling to these and potentially other buildings on campus. The CWHN enables heating and cooling loads to be managed across the network with intelligent control to deliver the highest efficiency, lowest tariff energy. The system can integrate with developing technologies to add, transfer, or remove energy from a network, as evidenced by the integration of the Mixergy, Upside and Origen components. By using ground ambient temperatures, CWHN avoids costly insulation, and provides both cooling and heating in a single circuit. The CWHN can accept heat from the Origen system. It will provide heat pumps to enable the Mixergy demand response mechanism, and respond directly to demand prompts from the Upside platform (for enabling/disabling heat pumps for grid balancing). Terra Firma Ground Investigations (TFGI) are providing the specialist drilling and pipework required for BEN. TFGI have particular capabilities in rapid well delivery in dense urban areas, and also in well development (achieving the highest possible yields). Key personnel include Mark Bradley, who is a geologist, and Charles Morrison, a highly experienced lead drill operator. Upside operates a cloud-based service that coordinates energy stored in uninterruptible power supplies, home energy storage systems, grid scale battery systems, electric vehicles, electric vehicle charge points and thermal stores (including thermal inertia of buildings), even on small sites (with power loads <50KW). This creates a Virtual Energy Store (VES) that will be used to provide balancing services to grid operators, distribution network operators and energy suppliers. They share the revenue from these services with device owners, device manufacturers and their installers, giving them an incentive to participate in the service. These revenue streams enhance the value of the equipment Upside coordinate, thus helping manufacturers grow the market for their equipment. This gives manufacturers and their channel partners further incentive to sell Upside's service, and helps increase market penetration of “green” devices such as heat pumps and electric vehicles. 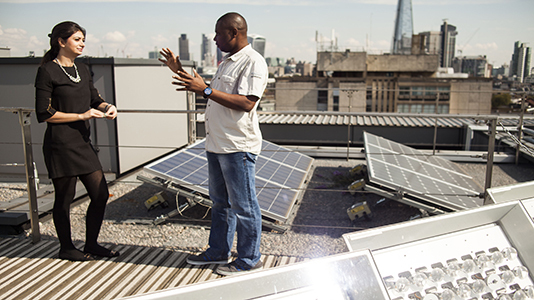 Upside was created for the Nesta Dynamic Demand Challenge in 2013, with the mission to enable domestic and small business sites to participate in demand response schemes and hence help reduce the cost and environmental impact of the grid. Upside have won a number of research grants, including three from Innovate UK (under the Localised Energy Systems call of 2014, Integrated Energy Supply Chain call of 2015 and First of a Kind Infrastructure call of 2016) and one from DECC (under the Energy Entrepreneurs Fund phase 4). Recently named on the Global Cleantech 100 Ones to Watch list, Upside have won numerous awards in the last 18 months, including at the 2016 Innovation Competition at edieLive and the BusinessGreen Smart Grid Technology of the Year Award, 2016. Mixergy is a spinout company from the University of Oxford. Mixergy have been developing novel hot water tank technologies over the course of a 4 year research project. The ambition behind this project was to understand the extent to which domestic hot water storage could help reconcile the challenge around balancing the supply of and demand for energy. This work culminated in the filing of 5 patents relating to hot water cylinders, along with a product launch into the domestic market with sales being made through Scottish Southern Energy. These systems were made by Newark Copper Cylinder limited. In addition to control strategies, the Mixergy tank will be designed with a conventional inlet flow arrangement alongside a novel flow path with an integral diffuser. This enables BEN to quantify the benefits of enhanced stratification, which is estimated to translate into a 10% improvement in heat pump efficiency and 20% increase in hot water capacity. Origen Power technology uses natural gas to generate electricity in a way that removes CO₂ from the atmosphere. At the end of the process, there is less CO₂ in the air than there was at the outset. Current technology that uses natural gas to generates electricity results in ~400g of CO₂ being emitted into the atmosphere for every kWh of electricity produced - whereas using the Origen Power process to generate electricity results in the removal of ~800g of CO₂ from the air for every kWh of electricity produced. Origen Power's solution is neither land intensive nor energy-intensive - it has a small land footprint and the process removes CO₂ from the air, even as it generates electricity. Origen Power has the potential to address the energy trilemma of delivering low-cost, low-carbon and secure energy and it will lead to the development of a revolutionary new design for power stations - power stations that cleanse the air of CO₂. Origen Power feeds natural gas into a fuel cell to generate electricity. The heat generated breaks limestone (CaCO3) down into lime and pure CO2. It is configured so that all of the CO2 generated – both from the fuel cell and the calciner – is generated at over 99% purity. This pure CO2 can be geologically sequestered and the lime that has been generated absorbs CO2 in the air to re-form CaCO3. The process is 48% chemical-to-electrical efficient and results in the net removal of 800g of CO2 per kWh generated.